I just hate to waste leftovers in the kitchen, don’t you? My mind is often busy with trying to figure out how to repurpose the fruit or herbs that are strained from tinctures or vinegar after the infusion process is over. Some things are too pretty for the compost bin! For example, when I was making applesauce, I used the discarded peels of the fresh apples to make apple-infused spiced rum. Another time, I dehydrated some leftover diced apples and pears that I had used to make a mixed fruit vodka and they get added to cups of warm tea, cider, or mulled wine. So when I finished my Ginger Citrus Syrup and was left with delicious, sugar-infused ginger slices and citrus fruit peels, I couldn’t just waste all of that goodness, could I? After a few hours in the dehydrator, the ginger and citrus bits were no longer sticky and they crumbled easily. I let them come to room temperature. Grind them all for a few seconds and then give it a taste. Adjust the flavors as you like. Your imagination is the limit! 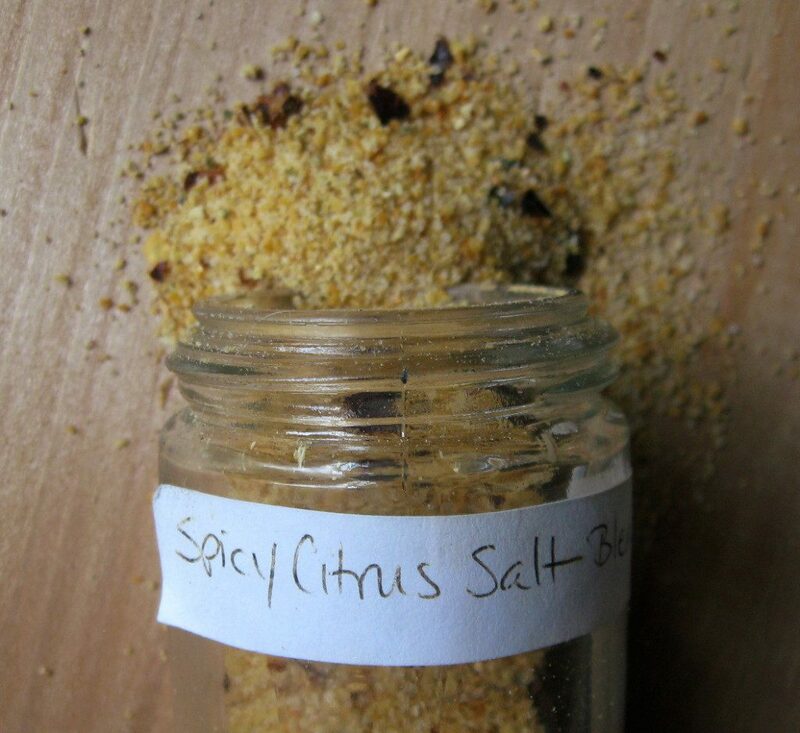 The final result of my Spicy Citrus Salt Blend is quite nice. It has a punch of citrus flavor, the salt is balanced but definitely present, and the spice is not overwhelming, and the entire blend is accented by the ginger and residual sugars from the syrup. I use this spice on fish and chicken, primarily. It also works well with any light flavors…basically anything you would use with white wine. So next time you are about to toss some fruit or veggies or herbs from your latest mad scientist experiment, stop! Consider making a new seasoning blend for your pantry instead.